“Let’s pause for a while, follow a procedure and search for different sensors that could allow us to recalibrate our detectors, our instruments, to feel anew where we are and where we might wish to go. 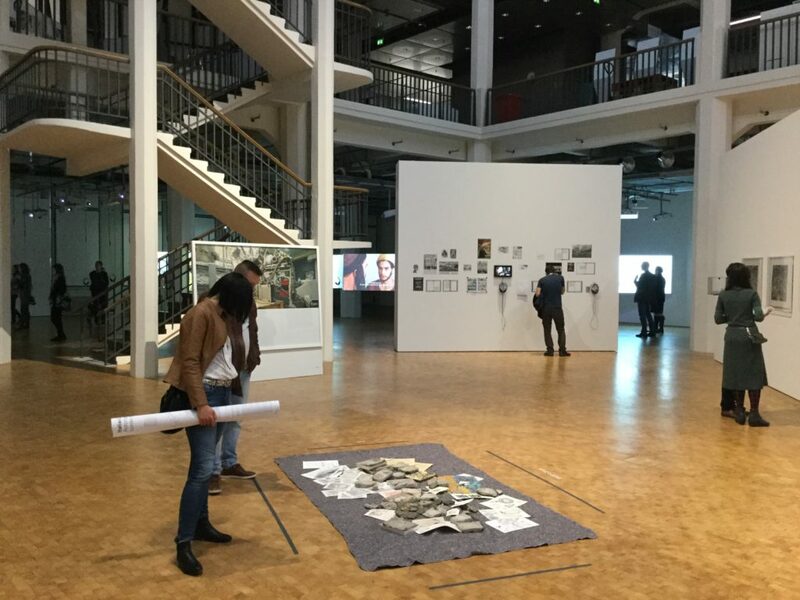 As an impatient visitor of exhibitions, but an anthropologist passionate about analysing knowledge in the mode of the exhibition, I was most curious about the making of “reset Modernity!” when I visited it on its opening weekend. 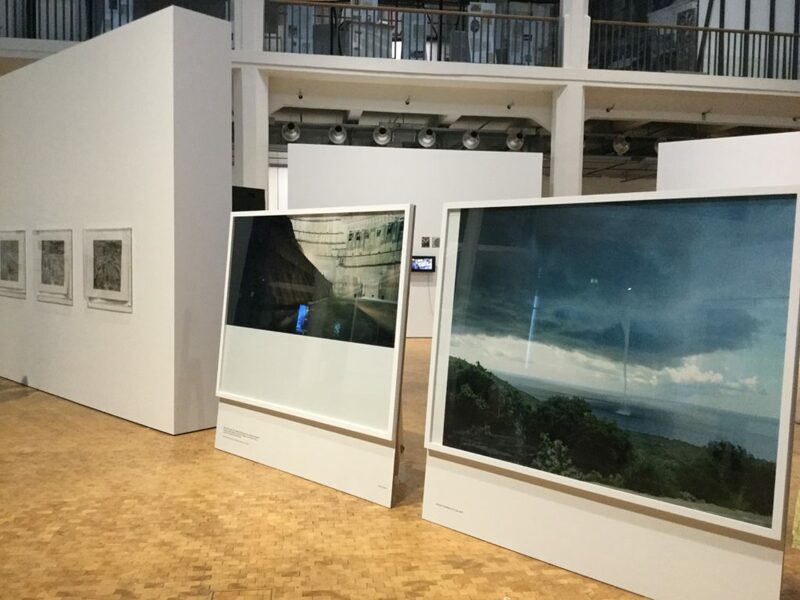 Would space be reserved for reflection on how this Gedankenausstellung became an Ausstellung? And if so, what kind of spatial arrangement could express the localising qualities of this very representational work? Did they stay strong? And was that the right approach? (It shouldn’t be, see Latour/Weibel 2007: pp. 94-95) They did keep to their plan, and while the catalogue and website document how the research network took on the risks of interdisciplinary work (intertwining research, debate and theatre with analogue and digital design in different locations and constellations) the exhibition includes traces of their original working practice in the form of “stations” implemented in each procedure. Here, thematically related quotes, notes, images and audio-recordings are provided and loosely arranged on a single white wall. These arrangements are aesthetically reminiscent of the associative Warburgian atlas production – without claiming to be exhaustive. 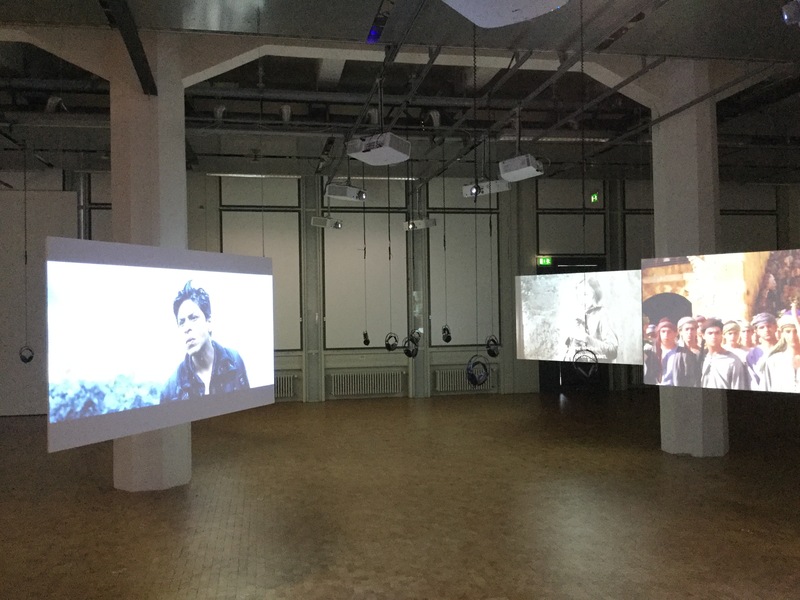 Quite the opposite: These stations point directly to another, virtual actor — potentially a zettelkasten of the AIME team and its collaborators, which could be a probable source for the arrangements. 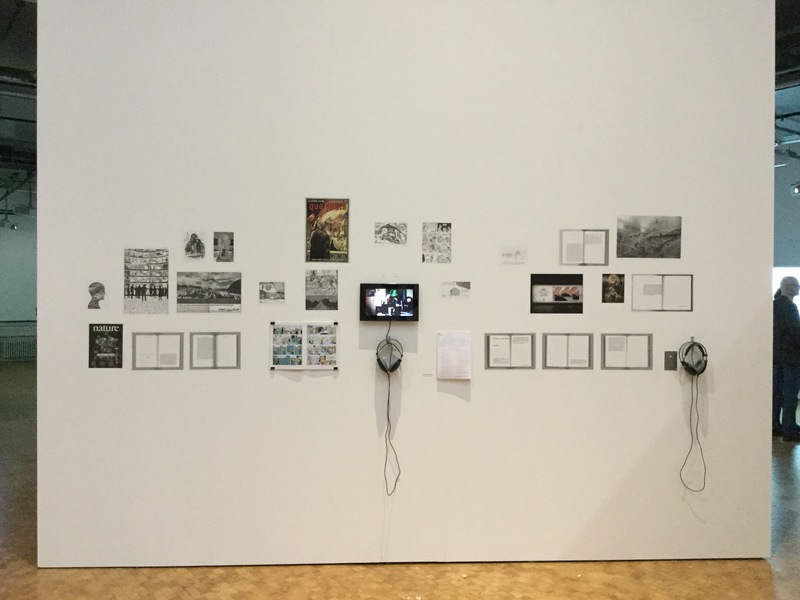 The looseness of the wall arrangements and the virtual zettelkasten cautiously suggest the existence of selection, but not to the ways in which the selection took place. 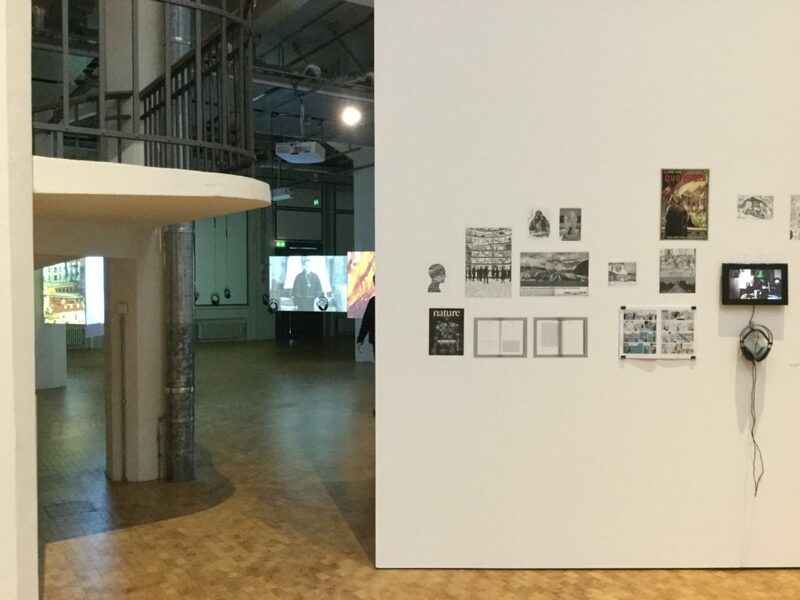 Which lines were drawn between those artworks and references that became part of the spatially, temporally, financially limited exhibition-project? Which artworks and references made their way into the exhibition while transgressing these lines? And which ones never did become a part of it, despite having the strongest of qualifications1 Since much of the “field book” isn’t a “fieldwork notebook”2, the stations don’t offer these types of insights into the representational work. Given that these processes are always driven by tension and passion – which shape the agency distributed between the actors – these walls have a lightness, they breathe and invite the visitor to do the same. But do they provide the quiet that, as Bruno Latour mentioned in an interview with Hans Ulrich Obrist (http://modesofexistence.org/what-is-a-gedankenausstellung/, 26:14), is necessary for a reset? The field book proclaims that they are “a sort of workplace … this is where you will find more information and where you can discuss the path of the inquiry” (field book, p. 2). Here something might have been lost between the original vision and its spatialisation. The very discreteness of this AIME-archive (the table with books at the intersection of three procedures should also be mentioned) is partially the result of the large, all-consuming two-dimensional artworks that surround these stations. Walking through the exhibition, these spectacular images again and again captured my attention: the more-than-realistic, staged photographs of Jeff Wall showing scientific practices; Armin Linke’s photographic work, which seemed to be part of almost every procedure, and simultaneously points to humanity’s intriguing megalomania and smallness and, visible from far away, at the end of the first exhibition hall, the floating walls of film projections in procedure five. The latter, called “Secular at Last”, resonated with the large scale of the other pictures. 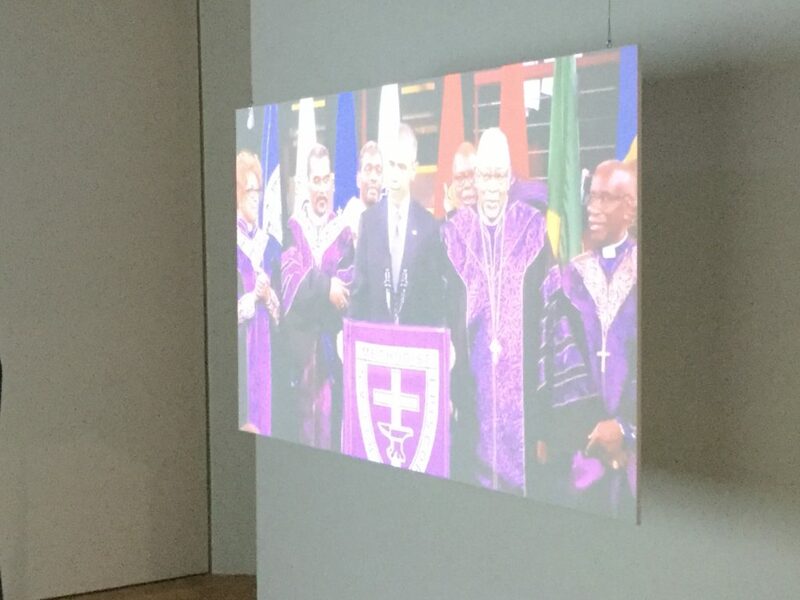 One work in this procedure is spatially secluded by a triangular installation of screens: “Obama’s Grace” (Lorenza Mondada et al, 2016). Here, the performative force of Barak Obama’s combination of political statement and religious “sound” is disturbingly intensified. An analytical transcript on one of the screens, however, demonstrates the extent to which this intensity stems from both the president and his parish. When standing between these three screens, the need for a way out of modernity’s binding forces could not be more obvious. Time for a Gedankensprung! Peter Weibel, Bruno Latour (2007): Experimenting with Representation: Iconoclash and Making Things Public. In: Sharon Madconald/Paul Basu: Exhibition Experiments. Malden/Oxford/Carlton: Blackwell, pp.94-108. 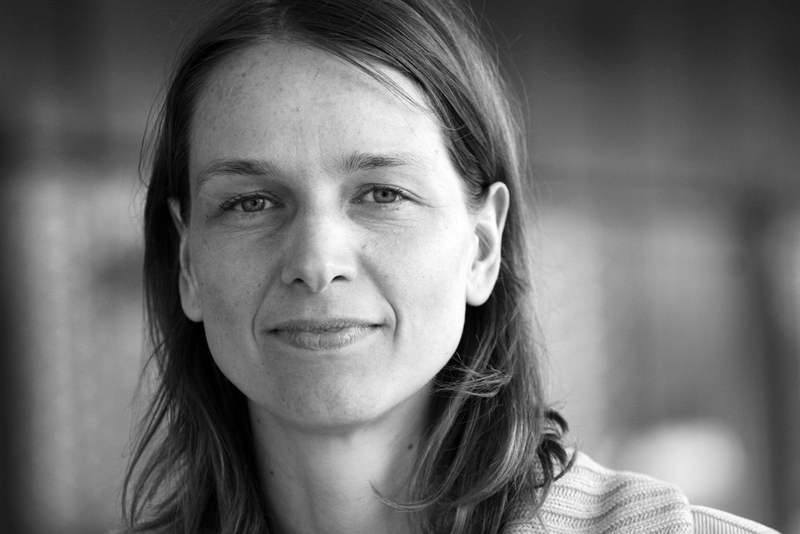 Alexa Färber is Professor of Urban Anthropology and Ethnography at the HafenCity University Hamburg. She received her PhD. in European Ethnology from the Humboldt University of Berlin. She was post-doc fellow at the Centre Maurice Halbwachs, Ecole normale supérieur, Paris and a guest professor at the Institut d’urbanisme de Paris, Université Paris Est, Créteil. Between 2011-2014 she has been the primary investigator for the “Low-Budget Urbanity” research initiative. Her research interests include methodologies of assamblage research in urban studies, urban imagineering, Islam in urban space and mobility.